Chelsea winger Willian is considering a move to Manchester United this summer, according to a Sky Sports journalist. The Brazilian international has been linked with a move to us to reunite with Jose Mourinho for more than a year now. 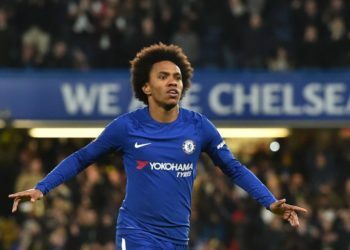 Reports suggest that Willian has fallen out with Chelsea manager Antonio Conte and that the 29-year-old will demand a transfer this summer if the Italian remains in charge. Well, it’s been two weeks since Chelsea’s season finished and the Italian is still in charge at Stamford Bridge. This would suggest Conte will still be in charge at the start of next season. Speaking on the Transfer Talk podcast, Sky Sports reporter Peter Graves revealed that Jose is interested in signing the winger, but that a move may only be possible if Conte leaves. “There is an interest from Manchester United in bringing Willian to Old Trafford,. Willian is a fairly regular player in Conte’s side, though often doesn’t complete the full 90 minutes. The Brazilian international competes with Pedro for a starting place in the Chelsea lineup and they are often replaced in the second half.